The CMS Counter measures Kit was a popular medium leve countermeasures sweep kit in the 1960's 1970's 1980's and can still be obtained today. the service to others. This is one of our most popular kit because of it's versatility, advanced features and price. The kit is built around the Advanced Transmitter Detector (see specs above) which features both Geiger counter readings and audio readings through headphones, built in sensitivity switch and the all important verification mode so you'll know instantly if you are picking up a bug or just a radio signal. This unit sweeps frequencies up to 600 kHz in two ranges. Three additional probes are including giving you the ability to provide extra measures of privacy protection. The Infrared Probe detects light beams, especially lasers (a popular way to transmit audio). The Line Driver Probe gives you the ability to check any wire you find during a countermeasures sweep to see if it is a wired hidden microphone. The Carrier Current Probe & Video Camera Probe detects for carrier current eavesdropping on all electrical wires and outlets and also detects the presence of hidden video cameras. The Advanced Wiretap Detector is included in the CMS 12 Kit which lets you conduct testing of telephone wires and the telephone itself for wiretaps. The CMS 11 Kit contains all of the above but the telephone testing unit is the Tap Trap II. 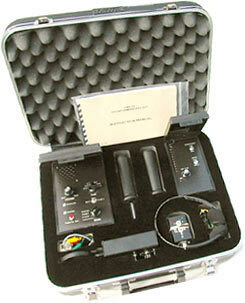 A handsome carrying case and detailed instruction manual gives you a complete and professional countermeasures kit.